#Giveaway #RC iHome Disney Speakers #WheresMyWater CLOSED! My Estrella just had another birthday recently and this year, she wanted to add items to her iPod that she got over the holidays. She got some great headphones and a iPod cover, but one thing that she really wanted that I was able to give her was a speaker for it. I was sent a Wheres My Water Disney iHome Speaker that made for the perfect speaker to go with her iPod. She loved the sound quality, which I also found to be great and she loved that not only could she hook it up to her iPod, but she also found that she could hook it up to my phone and talk to her friends on the speaker phone feature using it. This made the sound quality on speaker phone so much better, in fact the clearest I have ever heard a speaker phone sound. I also really liked the bag that came with her speaker so that she could store it away safely when she was not using it. In all, both Estrella and I found the Wheres My Water iHome Speaker by Disney to be the perfect speaker to go with her iPod! 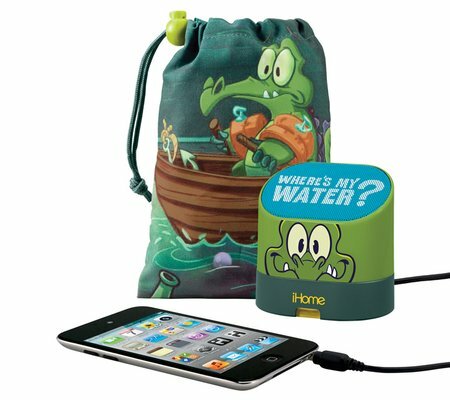 Since we love the Disney iHome Wheres My Water Speaker that we were sent, the wonderful people from eKids would like to send one of my readers their own Disney iHome Wheres My Water Speaker!! Previous Post #Giveaway #RC Celebrate with Merci Chocolates #MerciAwards CLOSED! My grandsons would love the Phineas and Ferb walkie talkies. My grandson has a birthday coming up & I think he may just get these!! That speakers looks good. My little princess would love it. I like the Bow-tastic Walkie Talkies.I also entered $100 Kohls. I like the Cinderella Sing-a-long MP3 Princess Microphone. I entered the Contours Classique 3-in-1 Bassinet giveaway. I also love the Perry Walkie-Talkies. Thanks for hosting! Love the Agent P earbuds. I entered Deuter Little Star Sleeping Bag! I would love to have The Perry walkie talkies! The Agent-P Earbuds are so silly and cute!! The Perry the Platypus Walkie Talkies are pretty cool! My kids love Perry! I like the Bow-Tunes Alarm Clock. I like the Perry Stereo Speaker System for iPod. My boys would also love the vroom box.